This document was originally published in The Drama: Its History, Literature and Influence on Civilization, vol. 7. ed. Alfred Bates. London: Historical Publishing Company, 1906. pp. 181-183. In Tartuffe, a comedy in five acts, Molière relates the story of an attempt, by an irreclaimable hypocrite, to destroy the domestic happiness of a citizen who, charmed by his seeming piety, has received him as a prominent guest. In painting such a portrait, this lively assailant of Parisian foibles was in a new element, though one that proved to him perfectly congenial. His genius had a serious side, and on that side he was unquestionably at his best, the character of Tartuffe being drawn with a strength and precision which few dramatists have equalled. By a process of self-revelation, and almost without the aid of dialogue or soliloquy, the heart of a man who could neither desire nor endure any close investigation is discovered and ascertained in all its intricacies, with the certainty of navigators tracing the line and bearings of an unknown shore. In the delineation and grouping of the other personages, also, the instincts and power of a great artist are clearly revealed; nor does the author fail to avoid the pitfalls inseparable from such a subject. True religion is never confounded with hypocrisy, but is upheld with a warmth that suggests the fervor of his own religious sentiment, which shows his characteristic hatred of imposture in any shape. 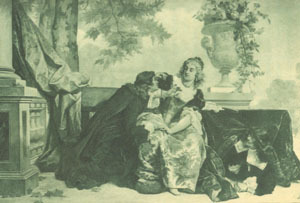 The first three acts were produced during the fêtes held at Versailles, nominally in honor of the queen and Anne of Austria, but really to please the maid of honor who had now become the king's mistress. It would be impossible to exaggerate the effect produced by this gruesome picture upon its first beholders--upon the mass of revelers who, resplendent in masquerade attire, filled the theatre in every part. Not only did the entertainment differ entirely from what they had expected, but the author, who seems to have been born to make the world laugh at itself, showed that he had also the power to confront them with one of the deepest mysteries of human existence. The king at once perceived the genius displayed in Tartuffe, and was also clear-headed enough to see that it was aimed exclusively against hypocrisy; but from the moment it made its appearance in Paris another and heavier storm began to rage over the head of the dramatist. According to his assailants, he had at length thrown aside the mask altogether, and under pretense of exposing hypocrisy was seeking to undermine the foundations of religion itself. Roullés, the curé of Siant Barthélemy, took upon himself to damn the author of Tartuffe on his own authority, and another virulent denouncer of the play was the bishop of Autun, supposed to be the original of the stage imposter. The agitation steadily increased until the king deemed it prudent to prohibit the performance in Paris of a play which he had unreservedly approved. Irritated by his disappointment, Molière registered a vow that, sooner or later, the interdiction should be set aside, and before long awakened such a friendly interest in his drama among the leaders of society as to induce the king to withdraw his prohibition. This was made the more easy by the anxiety of the fashionable world to taste the forbidden fruit, the salons competing with each other in their inducements to have Tartuffe read in the presence of a select audience; for "no greater pleasure," they said, "could be afforded them." Molière complied with many of these requests, inasmuch as they gave him an opportunity of dispelling the numberless misapprehensions in regard to his play, and of inspiring a wish to see it performed on the stage. His first private reading was before the pope's legate and a party of prelates, who, imagining Tartuffe to be a covert satire against the Jansenists--an idea which, however erroneous, the author took no pains to dispel--decided very strongly in its favor. The Jansenists placed on it an entirely different construction, while Molière, adroitly answering the questions put to him, managed to win over both sides, and that without suffering any twinges of conscience. Tartuffe Monologue - Orgon's monologue from the play. Tartuffe Monologue - Cleante's monologue from the play. Tartuffe Monologue - Tartuffe's monologue from the play. Tartuffe Quotes - Famous quotations from the play.